That’s right, I’m grillin’ in the rain. For me, grilling is something that I apply all year round and it can be both a time saver and helps minimize the kitchen cleanup more often than not. So, before we get into what I had on the grill tonight I wanted to talk about what you might have noticed with the last few recipes. If you have seen any of my facebook food photos or you have been the recipient of a food text, you know I cook a fair bit of meat. Usually there is a protein that is part of every meal that I make whether that be steak, chicken, fish, pork, or turkey. But I had a realization earlier that part of my goal with this blog was to reach beyond what I normally do to continue to share my passion for those who are on this fare journey with me. I realize that I have some people who may be reading this blog who might not be big fans of meat, and I want this to something for everyone. So, I will make it part of my mission to include you all. Fear not, while my brain billows with smoke to create recipes and posts, I am working on ideas to have meatless meal options that I plan to share down the road. With that in mind, we will get back to the main (side event). Tonight, on the grill, is………. This is just one of many, many things you can grill that can make a great addition to any meal. Don’t worry, we will get to some of those later. 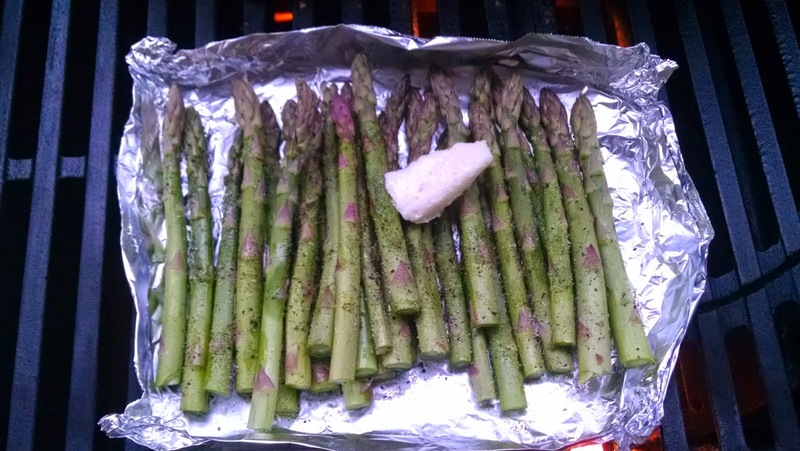 Wait, how do we grill asparagus without losing them all in the slats of the grill? Or without a basket? Allow me to introduce you to the tinfoil plate. Yup, it is that simple. Really. Even I can be an artist and create beautiful tinfoil plates. 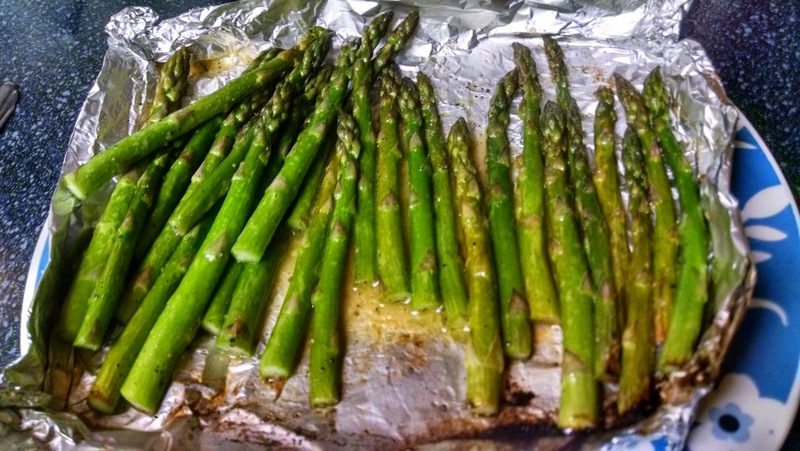 Asparagus seasoned with olive oil, salt, pepper, and a little butter. Or more butter if you are channeling your inner Julia Child. If so, that is totally OK with me! Place the foil on the grill at about medium heat, & it will probably take 12-20 minutes. So, enough time to find/refill your beverage. 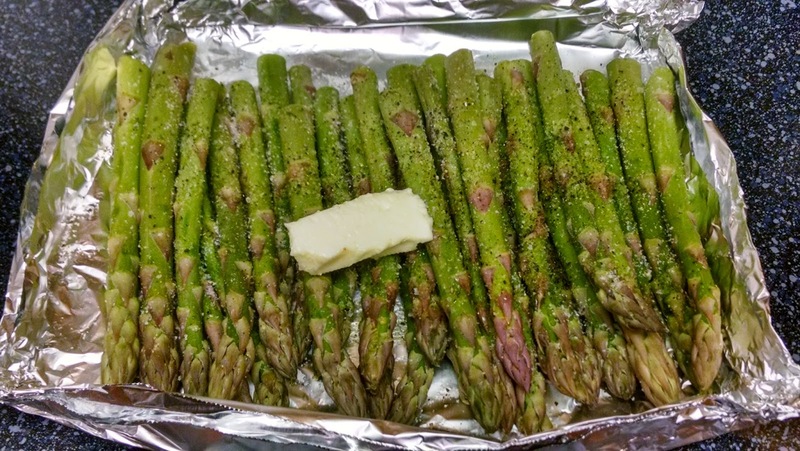 Here is your finished asparagus. They should be tender but still be a little crisp when you bite into them. If you need to impart a little more flavor before you serve these, hit them with a little lemon juice. This gives the asparagus a great little zip and allows you to serve them with a lot of different dishes.